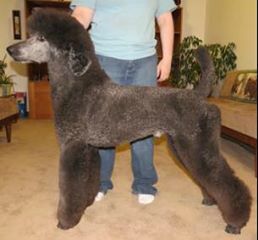 This Poodle Color should be a beautiful deep jet black. No hint of blue or silver in it. The face when shaved should be almost, if not as dark, in color as the main coat. A true black should never fade and they should never have white or silver guard hairs. Blacks must have black points and dark brown eyes. A lot of Blacks unfortunately do grizzle or Fade. I faded Black should not be confused with a blue. Notice the lack of the brown cast on this black in direct sunlight. A brown cast is either caused by a sunburnt coat or the dog being a blue. ​ This color is genetically black. It carries a copy of the fading gene. Blue poodle puppies are born black and turn blue by three years of age. A true blue can be identified by 8 weeks of age, there will be a faint but noticeable difference between the muzzle hair and the topknot color. 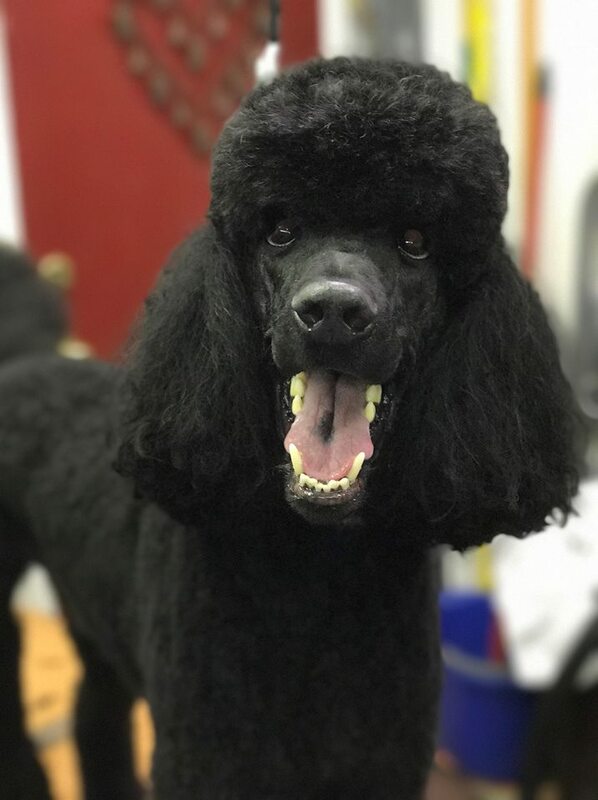 This poodle color takes the longest time to clear. Puppies at a young age will have brown highlights showing they are a blue not black puppy. There is a variety of shading in this color with the ideal being a dark color metal gray. There are varying shades of blue as in any color. It is also very common for a true blue to get a grey ring along the edges of their ears. 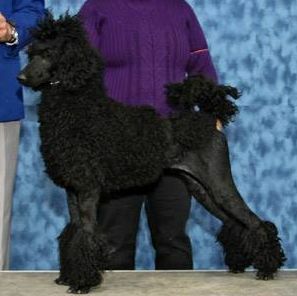 Blue poodles should have black points and dark brown eyes. This color is genetically black. It also carries 2 copies fading gene. Silvers are born black and clear over time. Silvers should have silver noticeable fading on face and feet by the age of 6 weeks, and a silver face by 8 weeks to be a real silver poodle. There are varying shades of silver from sparkling platinum that is almost white to a beautiful pewter color. Silvers must have black points and dark brown eyes. Black, Blue and Silver Puppies. All about 12 weeks old.